When you hear the name “Bugatti”, it’s safe to assume most would think of the Veyron. Volkswagen revived the brand with the release of the first production Veyron in 2005 and since then, the marque continues to set the pace for exotic car manufacturers whose sole purpose is to create the fastest road cars on the planet. Bugatti has (controversially) held the high speed record, and they do this while maintaining a level of class and elegance synonymous with the brand. The Geneva ’12 debuted Bugatti Veyron 16.4 Grand Sport Vitesse currently carries the record for the fastest open-top roadster at 254 mph, a feat just recently achieved on Volkswagen’s test track. Only eight of them are being built, and one of them happened to be right here in the Pacific Northwest! … And the usual suspects were also out in force! 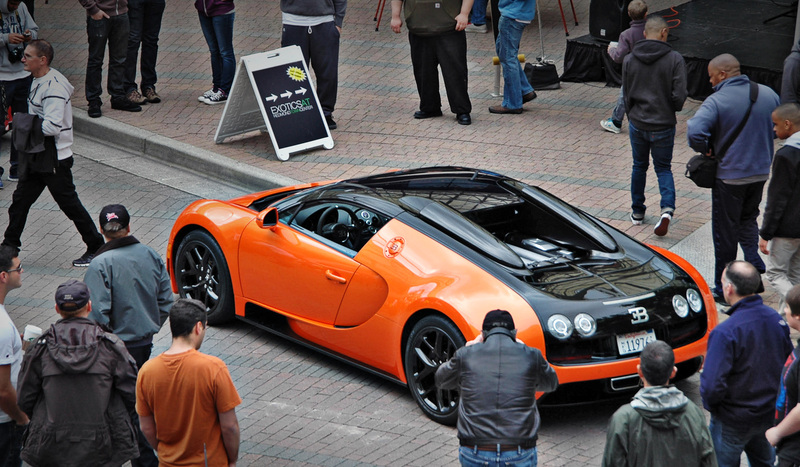 The Exotics@RTC event continues every Saturday (weather permitting) at Redmond Town Center. Cars roll in at 8:30 and usually stick around for a few hours. It’s the perfect reason to get out of bed early on a fine PacNW Saturday morning and take in automotive greatness. This wasn’t our first go-around and certainly won’t be our last. We’ll continue to add to our existing Exotics@RTC gallery. Get yourself out there one of these days and check it out. And who knows, maybe we’ll bump into you!